The title itself is enticing. The content is surprising in so many ways. The outcome is magical, that is, if you get to the last page—and do something with the newly acquired knowledge, as if it’s your new lifestyle. Or much fitting to say—magical life. Honesty is the first thing I like about the book. No doubt, I was enticed and intrigued by the title but while reading I’ve been warned: if I want to change and become the person I want to be, I may proceed to my heart’s delight; otherwise, I can have self-contemplation. Both are essential tasks, but the latter has been taking much of my time that I needed a compelling stimulus to help me get started on where I want to go and want to be. 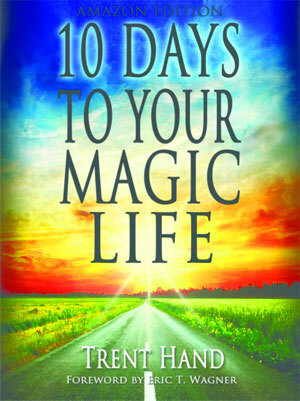 10 Days To Your Magic Life by Trent Hand definitely give me the push to start moving and abandoning all the alibis, or some. I like reading stories and to my delight the author didn’t hesitate to share his dreams, frustrations, efforts in achieving his goals, and—the triumphant moment—leaving the life he ever dreamt of. Learning another story of success makes me believe, even more, success is a reality that can happen to anybody. Throughout the ebook I learned various quotations with varying impact and leaving you in different states for a moment: happy, inspired, afraid, and stunned. It is one of the most nerve-wrecking facts of life. Wouldn’t it be nice to discipline ourselves than to reprimand ourselves for the rest of our existence? The essential part is how the author integrated the importance of strengthening faith to God. And the manifestation of faith—taking risk—is the challenge we all have to confront every day. I found myself wanting to go back and read the notes I’ve made while reading 10 Days to Your Magic Life in my iPhone and Kobo Vox. I wanted to remind myself of what needs to be done. That’s how stubborn I can be. Or better yet, having the courage to admit, I need encouraging words on a daily basis. How often do we hear affirming words from others to pursue our goals, which we only reveal to selected few for fear of being laugh at or not be taken seriously. We have to have a source of inspiration. That’s how the book is. It is your companion, coach, and confidant. Pick it up and make your own concoction of magic—to your fascinating life. LIVE it and dream no more.